These coconut macaroons are super-easy to fix, and you only need three ingredients! The macaroons are a super-simple combination of flaked sweetened coconut, sweetened condensed milk, and flavoring. They're also gluten-free! To vary the flavor, add 1/4 teaspoon of almond extract along with 2 teaspoons of vanilla extract. Feel free to add more almond extract if you like that flavor in your macaroons, or experiment with other flavors. 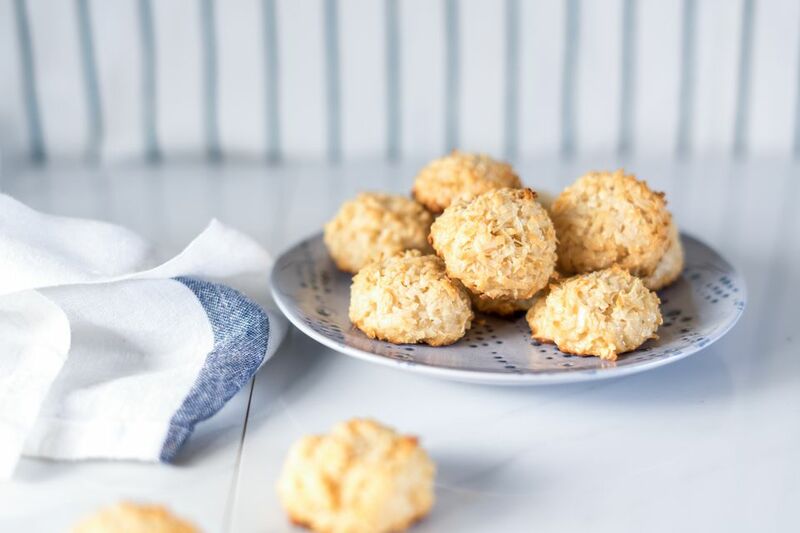 While the basic coconut macaroons are easy and taste great, they can be gussied up in many ways. Add some chopped toasted pecans or walnuts to the mixture or add hazelnuts. For holidays, you could give them festive color with about 1/2 cup of chopped candied red and green cherries along with 1/2 teaspoon of almond extract and 1 1/2 teaspoons of vanilla. Or stir in 1/2 cup of mini chocolate chips and some well-drained chopped maraschino cherries. Peanut butter chips, butterscotch chips, and brickle chips are some other good possibilities for add-ins. Or add 1/4 to 1/2 cup of multicolored sprinkles to match the season or occasion. Add a few drops of food coloring if you'd like. You could also dip them in melted chocolate. Melt 1 cup of semisweet chocolate chips with 2 teaspoons of vegetable shortening. Or drizzle melted chocolate over the tops of the macaroons. For chocolate macaroons, melt 3 ounces of unsweetened chocolate in a bowl over hot water or in the microwave. Stir the chocolate into the coconut and sweetened condensed milk and add 1 teaspoon of vanilla. Bake as directed. Dip them in melted white chocolate bark or melts for a two-tone effect. Line the baking sheets with parchment paper or nonstick foil. Spray the paper or foil with nonstick cooking spray. In a bowl, combine the coconut, sweetened condensed milk, and vanilla extract; blend well. Grease a teaspoon or cookie scoop or spray it with nonstick cooking spray. Using the teaspoon or cookie scoop, drop mounds of the coconut mixture onto the prepared baking sheets, leaving about 1 1/2 inches between ​the cookies. Bake for 10 to 12 minutes, or until lightly browned around the edges. Immediately remove the cookies to a rack to cool. Sweetened condensed milk shouldn't be confused with evaporated milk, which is called unsweetened condensed milk in some countries. The difference between the two is the sugar content. The sugar makes sweetened condensed milk a valuable ingredient for baking, and it increases the shelf life of the milk. If you don't have sweetened condensed milk, there are several ways to make a suitable replacement. In a deep saucepan, combine 1 1/2 cups of heavy cream with 1 1/2 cups of granulated sugar. Place the pan over medium heat and bring the mixture to a boil, stirring constantly. Reduce the heat to the lowest setting and simmer for about 20 to 30 minutes, or until thickened, stirring frequently. Remove the pan from the heat and let the milk cool before using in the recipe. These tasty little cookies can create quite a mess if the pan isn't prepared properly. Be sure to line the baking sheets with parchment paper and spray with nonstick cooking spray or use nonstick foil (sprayed) for best results.